Winter stockings of rainbow trout will continue every two weeks through the winter. Trout average 11-12 inches in size and are stocked in generous amounts. Stay on the lookout for golden alga, a microscopic organism that releases substances that are toxic to fish. Game and Fish is working with city park staff and lake consultants to regularly monitor for and control the unwanted algae. Please do your part to prevent the spread of golden alga by not moving water or wet objects or fishing equipment from lake to lake. Clean, drain and dry all equipment. The 2013 Class U Urban Fishing license is now 50% off through December 31. Stop by a Game and Fish office or any of our sporting goods or retail license dealers and ask for your 2013 discount Urban license for $9.25. 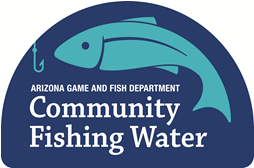 Remember the Web... www.azgfd.gov for stocking schedules, the Fish&Boat Arizona webmap, outdoor events calendar, and other great fishing and outdoor information. Also check out the web for Weekly Fishing Reports, to submit your fishing photos or to send us your latest fishing report. Talk with us on our Facebook page or get social with us on Twitter @AZGFD.